The Dacian Fortresses of the Orastie Mountains are Iron Age defense works built as protection against Roman conquest. They were built between the 1st centuries B.C. and A.D. by the Dacians, who lived in what is now Romania (between the Carpathians and the Danube). 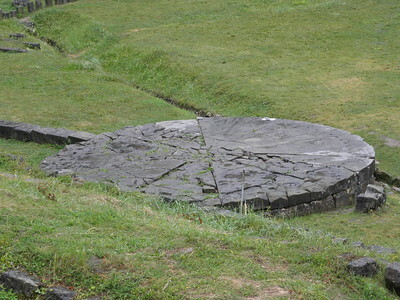 Sarmizegetusa Regia was the Dacian capital and the center of its political and religious power. It was built on a fortified mountain. The other sites formed a system of defense works to defend the capital. After their destruction by the Romans in 106, the sites were never reoccupied. One should get bonus points having visited this remote and obscure site. Only 6 registered WHS enthusiasts did so before me - this puts the Dacian Fortresses on the same difficulty level as Nisa (Turkmenistan) or Sana'a (Yemen). Information about the site, practical or historic, is hard to get. The more interesting ones that I found on the web I've added to the Links section at the left of this webpage. I planned to visit Costesti (2 locations) and mainly Sarmizegetusa Regia. Finding it is easy nowadays: the Dacian sites of Costesti are signposted from the main road in Orastie. All went very smoothly, until I had to start the unpaved road to Sarmizegetusa Regia. It's 18km long and full of potholes. Unfortunately it rained too, so that made driving there in a non-4WD even more adventurous. My effort ended about 2km from the site, where the road is full of loose stones and starts to go uphill. I didn't want to get stuck here, I doubt there will be more than a handful of visitors daily. So I parked the car at the side of the road and hiked the remaining part. It was still raining but I felt very determined in getting there! After many turns I finally arrived at a signboard "Sarmizegetusa Regia". From there it's still a short walk through the forest. There I already saw part of the Dacian road (impressively flat) and defense towers. The main complex is at an open field. 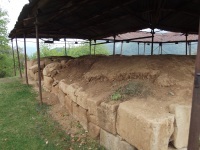 I had seen pictures of it beforehand, but I still was impressed by its scale and variety of the remains. Especially the huge solar disc draw my attention. Rain was still pouring so I didn't stay for long (I was also afraid that all the rain would make the road even worse). But I arrived safely back in Costesti. I had a look around how to get to the two fortresses here, but they are only accessible on foot (40-60 minutes). I decided against that as I already had enough of walking in the rain. On a summer day however this will be a wonderful trip, the scenery along the road is lovely (a river, a couple of farms and a mixed forest). It may not have been such a good idea to try to combine my annual ski trip with visits to World Heritage Sites along the way. This winter the ski resorts of my choice were Poiana Brasov in Romania and Bansko in Bulgaria. Accordingly, I attempted to visit the Dacian Fortress at Sarmizegetusa Regia and the Monastery of Horezu in Romania. I usually use public transportation for visiting WHSs, but this time I decided to rent a car to save time and therefore money. I left Brasov by bus at 6.30, arrived in Sibiu at 8.30, and explored Sibiu for a few hours. And then I rented a car in Sibiu at 12, got to Sarmizegetusa Regia at 14 and arrived at my hotel in Targu Jiu at 20. The following day I started at 6.30, got to the Monastery of Horezu at 8.30 and drove back to Sibiu at 12 to return the car. The car rental was 35 Euros and the gas was about 30 Euros. 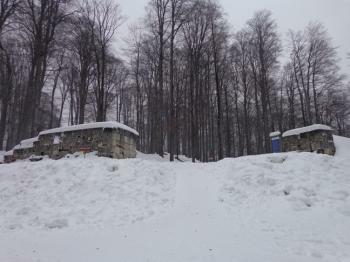 I ended up driving on icy roads to Sarmizegetusa Regia to find the fortress ruins covered by snow. But there were about a dozen tourists, mostly Romanians, at the site, as it officially closes at 15 in winter. Things can change rapidly in Eastern Europe and now it fell out for the best. Sarmisegethuza Regia is never more inaccessible, but neither it is free. (Els please remove it from the FREE list!) The road from Costesti has been repaired some places even tarred this summer, so you can drive up to the entrance easily with an urban car - we did it with a Renault Scenic. At the entrance a ticket booth was erected, there you can buy the entry ticket for 5 lei (cca 1,2 eur). Other kiosks are seemingly under construction -most probably in the next season souvenir shops and buffets will open. When we were there the parking was full, so there will be a considerable demand also. Though the road is significantly better than it was, it is still almost an hour s drive from Costesti where the tar road ends. It is advisable to spend the night there and begin the visit the next morning. As tourism begins to boost, there are a couple of good B&B s now in Costesti. We have found lodging in Pensiunea Cotiso - a place I can recommend to anybody. The place is spotless, meets the European standards, the kitchen is great - they serv traditional local cuisine mainly from ingredients they grow themselves or collect in the woods (mushrooms), and the owners are very hospitable - their daughter, Cristina speaks good English, and they have an English website also. Calpana - a short distance by taxi from the Calnic fortified church. Costesti Catatuie - by bus from Orastie to Costesti, then a 2km walk to the bridge where two tracks lead to Cetatuie and Blidaru respectively. I have visited almost all Dacian fortresses in 2007. Almost all the places are located in the remote, mountaineous area (you should have a good local map to get there or at least have enough luck to find a person that show you the right direction, 4 wd car is also recommended). The places itself are extremely worth visiting as they are the only surviving examples of once powerful culture of pre-Roman Dacian state. The most important monument is Sarmisegetuza Regia, remnants of Dacian capital with its sanctuaries, walls and other buildings. It is one of Romanian touristic "must".